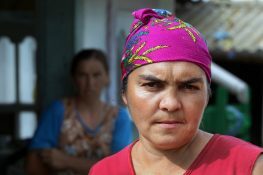 The Roma Women’s Fund ‘Chiricli’ and Minority Rights Group Europe, call on the Ukrainian authorities to ensure a fair and transparent investigation into the events in the village of Loschynivka, in Odessa Oblast, on the 27th August this year, which led to the Roma population of the village being forcibly expelled. This occurred after a Roma man was remanded in custody following the discovery of the body of a young girl, in a forest near the village. Following the discovery, a large crowd of the local residents attacked the homes of Roma in the village, Local police who were present during the attack, were seen to make no attempt to stop the violence. Following the violence, the village council made an official decision, signed by the head of the council, to forcefully relocate Roma from Loschynivka. After they were forced to leave they moved to nearby Izmail, where they are now staying with relatives. It has now been exactly one month, since the expulsion of the Roma community. They continue to stay with relatives. The village authorities have provided each resident with a compensatory amount, totaling 17 Euro each, a completely insignificant amount, given the trauma the community has faced and their immediate humanitarian need. According to local sources there were 24 Roma in Loschynivka, 17 of them were children. At present none of the children are able to attend school. We consider this situation to place the entire community at risk and is a violation of the fundamental human rights of the indviduals affected, it is furthermore in contradiction with OSCE principles. This incident further highlights the significant barriers the Roma population face in Ukraine, as a result of widespread discrimination and stereotyping, as highlighted in the recent findings of the UN Committee on Ethnic and Racial Discrimination. We call on authorities in Ukraine to urgently prioritise the creation of the conditions to ensure the safe return of the Roma population of Loschynivka to their homes, at the earliest opportunity. Furthermore, to ensure the displaced population receive effective financial and social support until they are able to return, including ensuring the children affected are able to continue their education. To date there has been no investigation or prosecution of those members of the village who initiated the pogrom, or into the decision of the local authorities to expel the community. We feel this further highlights evidence that police authorities lack the training and knowledge to prevent and address such incidents. With the experience of the OSCE contact point for Roma and Sinti in working with police authorities, we specifically recommend the OSCE and Ukraine authorities to prioritise the role via a programme of training around the recently developed manual on “Police and Roma and Siniti: Good Practices in Building Trust and Understanding’. It is also important, alongside the need to ensure the safe return of the Roma population of Loschynivka, for authorities in Ukraine to ensure long term programs are established to enable reconciliation between Roma and the villagers. We believe the recently adopted Ljubljana Declaration of the OSCE on Integration of Diverse Societies, provides strong guidance for states to undertake necessary integration measures. The OSCE has a critical role to play in supporting this process.